SUVA, Fiji (AP) — The man who first seized power in a military coup then refashioned himself as a legitimate leader appears set to rule Fiji for another four years. Prime Minister Voreqe Bainimarama and his FijiFirst party were headed for a convincing election win early Thursday as votes were tallied. Bainimarama has ruled the island nation since his 2006 coup, and won his first election in 2014 after returning democracy to the country. With about half of the votes counted, FijiFirst was ahead with 53 percent while closest rival the Social Democratic Liberal Party, led by Sitiveni Rabuka, was at 37 percent. The margin was closer than in the last election, when FijiFirst won almost 60 percent of the vote. Rabuka led two military coups in the 1980s before serving seven years as prime minister in the 1990s. Just this week, a judge cleared him of an electoral disclosure violation in a case that many viewed as being politically motivated. Heavy rainfall throughout Wednesday affected voter turnout. The bad weather prompted officials to close more than 20 polling venues, affecting more than 7,000 voters who were promised the chance to vote at a later date. “The weather is a bit discouraging,” said Akanisi Lal. That didn’t stop the 53-year-old from taking a break from looking after her family to vote for Bainimarama. Some voters were reluctant to say who they voted for because of fear of reprisals. “I don’t want to be victimized,” said Jashneel Kumar, a 24-year-old nurse. Fiji has not allowed the political tensions to take a toll on its vital tourism industry, which promotes the Pacific nation’s pristine, sunny beaches and friendly, welcoming people. Given the history of coups, political stability was a big issue leading up to the election, as were racial tensions and economic issues. Many people in the nation of 920,000 seem appreciative of the economic gains they’ve made under Bainimarama. But Bainimarama has a troubled political history that has contributed to the coup culture. There were rumors he could stage another coup should he lose the election. “We’re bound to have another coup if he doesn’t win,” said 30-year-old Robert Lum On, a recent university graduate. Fiji became independent from the U.K. in 1970. In 1987, Rabuka staged two racially charged coups to return the country to the hands of indigenous Fijians, who make up about 57 percent of the population, and away from Fijians of Indian descent, who make up 38 percent. Indo-Fijians have been a major ethnic group in Fiji since colonial times, when the British brought them in to work the sugar cane plantations. Many Indo-Fijians favor Bainimarama, whose new constitution in 2013 removed race quotas from Parliament. On the campaign trail, Bainimarama accused Rabuka of stoking the flames of racism that continue to divide the nation. But some indigenous Fijians believed Rabuka would help restore their prestige, and liked his promise to bring back the nation’s Great Council of Chiefs, which Bainimarama disbanded. Critics deride Bainimarama as authoritarian, but since forcing himself into power, he has changed his image into that of a stable, legitimate leader. His appeal was bolstered when he assumed the U.N. COP23 presidency in November 2017. 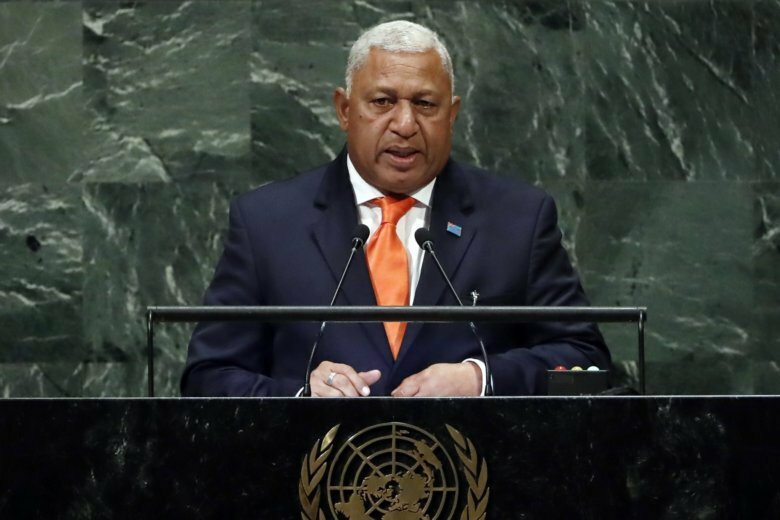 In that role, which he holds until December, he shaped Fiji into a pioneer on climate change issues. With COP23 as a platform, Fiji inserted small island developing states into the international conversation on climate change. The islands are on the front lines of global warming, rising sea levels and ocean acidification. After the 2006 coup, Australia and New Zealand imposed sanctions on Fiji, and Bainimarama reoriented regional alliances toward China. His critics accuse him of selling out the country to the Chinese. The Lowy Institute says Fiji received about $360 million in aid from China between 2006 and 2016, putting it behind only Papua New Guinea in the Pacific region. China Exim Bank holds 39 percent of Fiji’s externally held public debt, according to The Economist Intelligence Unit. Fiji’s relations have since normalized with Australia and New Zealand, but the period of sanctions enabled China to step up its regional influence. Fiji has one of the healthiest economies of the Pacific Islands, and GDP is predicted to grow above 3 percent annually through 2020. Tourism is the bedrock of the economy, accounting for more than 40 percent of GDP. Bainimarama’s government takes credit for increasing social services, including free primary and secondary education, free bus fares for seniors, and aid in the aftermath of cyclones. But widespread poverty persists. Bainimarama’s opponents vowed to raise the minimum wage, which remains only about $1.25 per hour.